I have had a few Telecasters in my life, from Chinese Squiers to American Deluxes to almost everything in between (including baritones and even a few oddball parts-o-Teles). I’ve always loved them, and I always seem to be able to come out with a great tune every time I sit down and play Tele time. I discovered the Baja Tele while shopping for a mid-priced Tele at my local big-box guitar store. 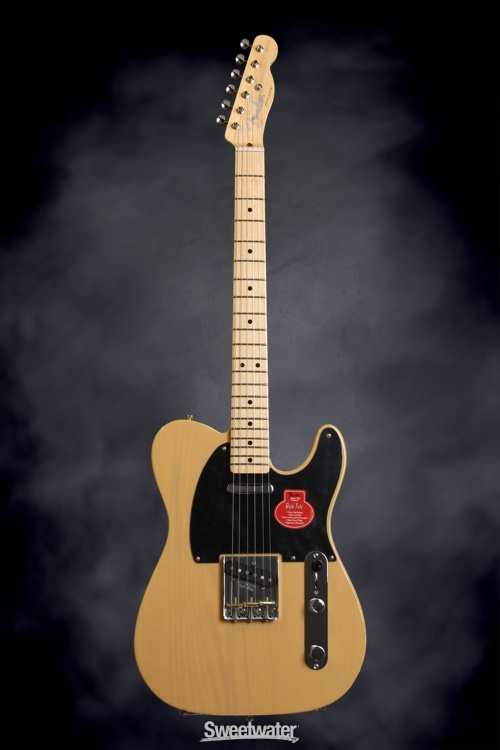 I was blown away and even more surprised when I looked at the specs vs. the price: Ash, custom shop pickups and wiring, V neck, smooth tuners, great finishes, and that wonderful Telecaster sound and playability. Wow! 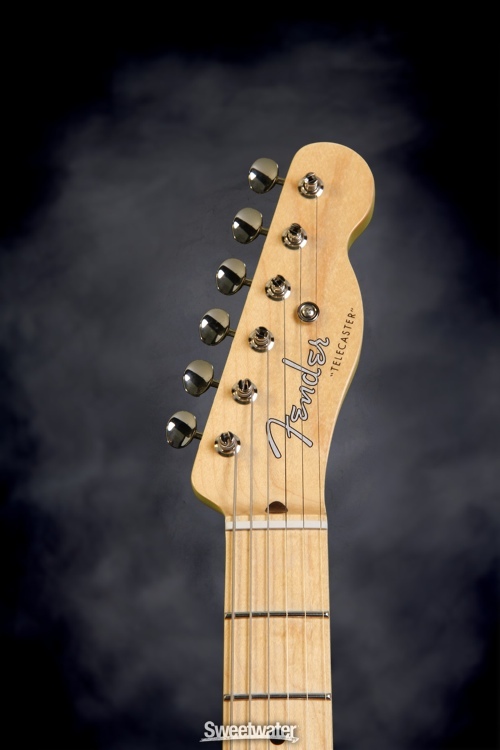 Looking for a mid-priced Telecaster (or even just a mid-priced single cutaway electric)? Shop no further. Proceed forth to your favorite purveyor of guitars and buy one before they stop making these! Just do it. They’re wonderful! The Fender Classic Player Baja is not currently available at zZounds, but they do have a great selection of Telecasters! Telecasters are (in general) quite simple. 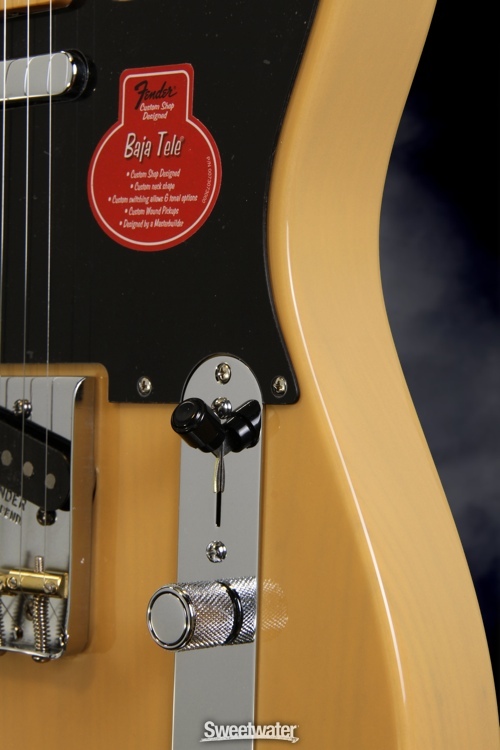 As I’ve said in previous reviews of Telecasters, I’d call them “simple genius.” They sound great, they’re possibly the easiest-to-play guitar available, and they have a sound that can go country, blues, praise, punk, rock, and even new age (with some pedals thrown in). Throw the switch, play the strings, and BOOM – classic sound. From Buck Owens to Bruce Springsteen to Brad Paisley to Jonny Lang and a host of others: The Telecaster has been the axe of the ages. As Telecasters go, the Fender Classic Player’s Baja Telecaster is quite feature-rich. The features of this guitar, along with its awesome build quality, are easily one of its strongest areas. For the money, these are FEATURE PACKED and one the nicest-playing Telecasters made (next to my 2006 American Deluxe Tele). I love the soft V neck. It’s awesome. The honey neck finish is superb on the hands, whether your hands are sweaty and hot or dry and cool – the neck is a true JOY to play and experience. If you play the Baja Telecaster and really give the neck a shot, you’ll be hooked. 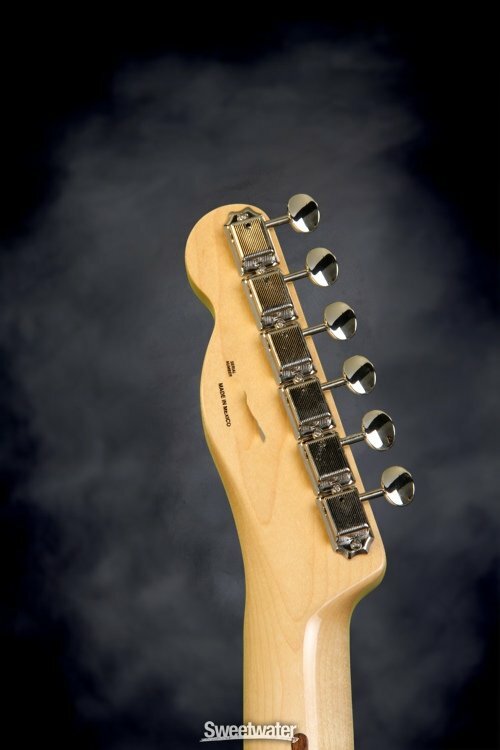 Telecasters with much more expensive necks often don’t feel as good as these. Like the Fender Jimmie Vaughan Stratocaster, these are some of the best “sleeper” products in the Fender line. You’ll come for the sound and stay for the playability! The body: it’s a rounded-edge Telecaster. They feel like they feel, they play like they play. In my opinion, the medium-weight, balanced ash body and maple neck are just fine. The pickups are diverse, the switching options are awesome, and the quality of the electronics is outstanding. There’s so very much to these simple pickups and wiring – much more than meets the eye. I’ve been able to over-drive the pickups of my Baja and get some of the nastiest dirtiest blues imaginable, then change amps or models and get sweet twangy single-jangly-coily-ness in just a few seconds. The Baja Telecaster is VERY versatile and truly meets and exceeds expectations in the sound department. Even if you’re not looking for that “spanky” Tele sound, set up some tubes or an amp model that gets to rockin’ and you’ll love the way it sounds! 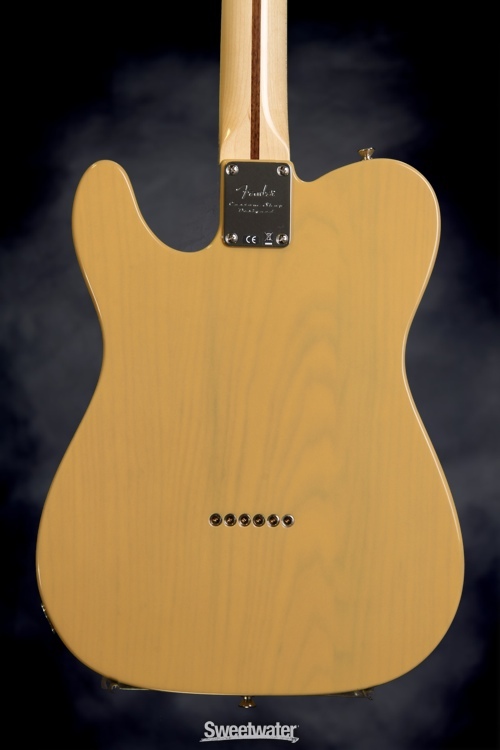 The nice density of the ash body is a great alternative to the everyday Fender alder body – and it makes a nice difference if you’re looking for a more “singing” sound… I love ash woods, even on other brands of guitars – and the Fender Baja Telecaster is no exception. The Fender Classic Player Baja Telecaster offers wonderful electronics flexibility. Tons of different sounds from just two “custom shop” pickups! I’ve had two (soon to be three) Bajas over the years since there introduction. Without doubt, the quality is a 10 out of 10. The build, the fit and finish, the quality of the electronics, the neck pocket fit, and the feel and finish of the neck are all just awesome. I’ve not picked up a single Baja that had a glaring issue (even those hanging out at guitar stores for long periods of time). I could write a volume or two about how well built my Bajas have been, but really, they would just say, “These things are built by real craftspeople who obviously love their instruments and the way they make their instruments.” They’re great. I have never had a complaint about a single one. Talk about legendary tone! A Fender Baja Telecaster playing through a genuine Fender amplifier is a lifetime of great tone and sound! I do wish this was offered in both of the blondes (the butterscotch and the sand). Not much of a gripe, or even a complaint. 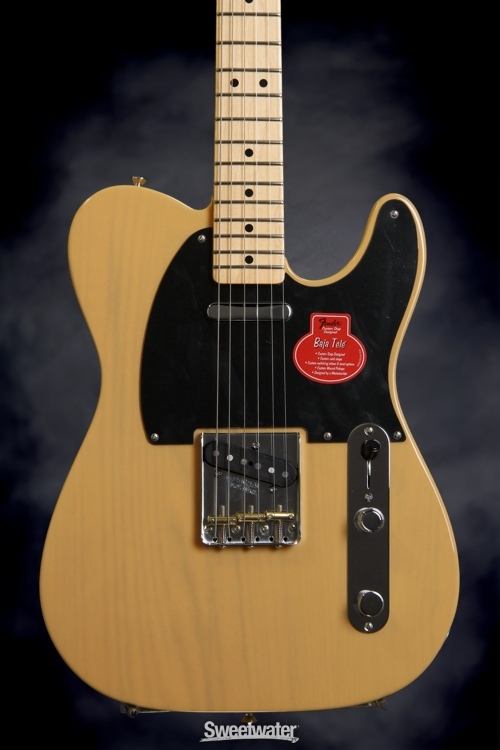 I just love the old school butterscotch blonde look on a Tele with a black pickguard and a maple neck. Thank you, Leo! I do wish these could come with an optional six-saddle bridge for those of us who are really critical about our tuning. If that’s the worst of it though, that’s not bad! Besides, the tone on the three-saddle bridge actually makes up for the intonation thing! This entry was posted in Electric Reviews, Guitar Review and tagged baja, classic player, custom shop designed, fender, guitar, review, single-cut, tele, telecaster by Jim of Vivid Peace. Bookmark the permalink. This is by far the best product Fender has put out for the price since the Roscoe Beck 5steing bass (1995). The Baja Tele just kills! This is the neck I have been waiting for for the last 40 years or so. The Baja Tele is the best of the best of what Fender has to offer. I’ve been a guitar player for about 45 years, playing in pubs and clubs, and in the last ten years bought, sold and set up guitars, so I’ve had quite a few through my hands. I’ve switched back and forwards between tele’s, strats and Les Paul’s but have to say I find the Baja the closest to perfection, even as good as the more expensive USA 52 re-issue. I’m really truly glad you replied to my review. To date, my favorite two Teles are my Baja and the American Deluxe Ash my brother gave me in 2006. It means a lot that you read and replied. Have a great end of year, and may your musical adventures be fulfilling!